GET BACK! FICTION IN PROGRESS! I realize it ‘s a slow week here at the blog but behind the scenes, I’m working at a frantic pace. With the new blog schedule, I’m supposed to get all geeky with geekery on Wednesdays, but this week I’ve got my nose to the verbal grindstone. Don’t worry though – Free Fiction Friday will not be interrupted and part two of Precarious Perch will be posted this week. My goal had been to finish the first draft of my current novel by…well…now. And while I’ve hit the neighborhood of my estimated word count, I haven’t quite finished yet. So I’m off to the trenches. On first glance, this next book will be a pretty big departure from Crimson Son. This one, under the working title First Song, is a more traditional fantasy novel that takes place in a mythical, Indus River inspired realm with lightning wielding monks, dragon deities and civilizations lost to a Timeless Age. But there are similar themes. The story follows a bug-humanoid known as an Ek’Kiru (I don’t simply add pointy ears for races, I mean, really let’s do that stuff right…) who was raised among humans as a Storm Temple monk. And though he’s a multiverse away from Spencer and his Augmented heroes, Sidge, the protagonist of my new novel, has to struggle to relate to a world much larger than he. Coming of age, grappling with powers far outside his own capability, and themes of loss and family unite these two books. I think fans of Crimson Son will find much to appreciate. My intent has been to make this new novel a single-book story as well. I’m breaking all the conventions here, I realize, and may pay a price for it. There have been rumblings about when to expect Crimson Son sequels. At the moment, I’m happy to share a single tale and let readers move on to some other fantastic place that I’ve cobbled together from the weirdness in my head. If you’d be so kind, someone else beat the drum for a few days and tell everyone to go and buy Crimson Son, ’cause publishing books and doing it RIGHT ain’t cheap and I have no intention of stopping now. And if you haven’t already, don’t forget to sign up for the Goodreads Giveaway of Crimson Son. Yeah, you can still buy a copy, too. They make great gifts and look good scattered about your house, or in a box in the backseat of your truck, or even on the shelf of your local library. Oh, and also? I’m totally stealing that meme up there. Is it a sign you have? 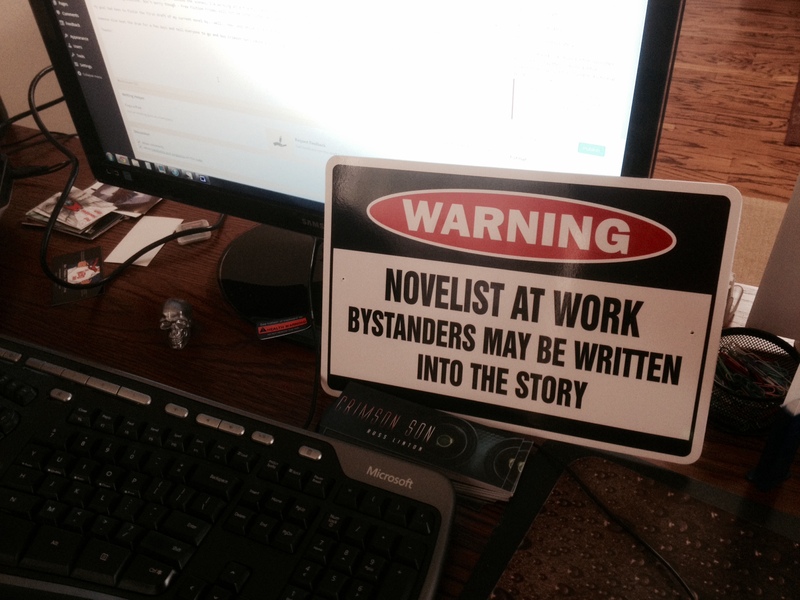 I think I need one for my home office door. I can ask where my wife got it but it was a gift. All I need now is an office with a door and it can double as a do not disturb sign. I found one on Amazon. 🙂 Good luck with that whole office door thing.